But for those who already knew Pope Francis as Cardinal Bergoglio, there was nothing surprising about the choice of that name. As the archbishop of Buenos Aires, Cardinal Bergoglio had already developed a reputation as a man of unusual humility, simplicity, love for the poor, and evangelical spirit. 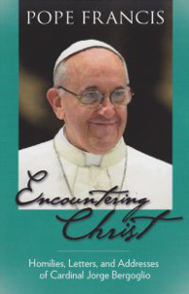 Encountering Christ gives the reader a glimpse into the heart and mind of Pope Francis. It offers a selection of homilies, letters, and addresses delivered from 2009-2013 as archbishop of Buenos Aires. These texts contain many of the themes that have already emerged as central to Pope Francis’ pontificate: love for the poor, the dangers of a self-referential Church, and the need to “go out” and bring Christ to the world. As the world learns more about Pope Francis in the months and years to come, these texts offer an introduction into the “spiritual priorities” of our new Holy Father.